Just like Hulk Hogan beating Andre the Giant at Wrestlemania 3, like Steve Austin defeating Bret Hart at Wrestlemania 13, and Marc-Andre Fleury passing hockey's greatest prize to his predecessor the symbolic passing of the torch has been one of the sport's greatest narratives. 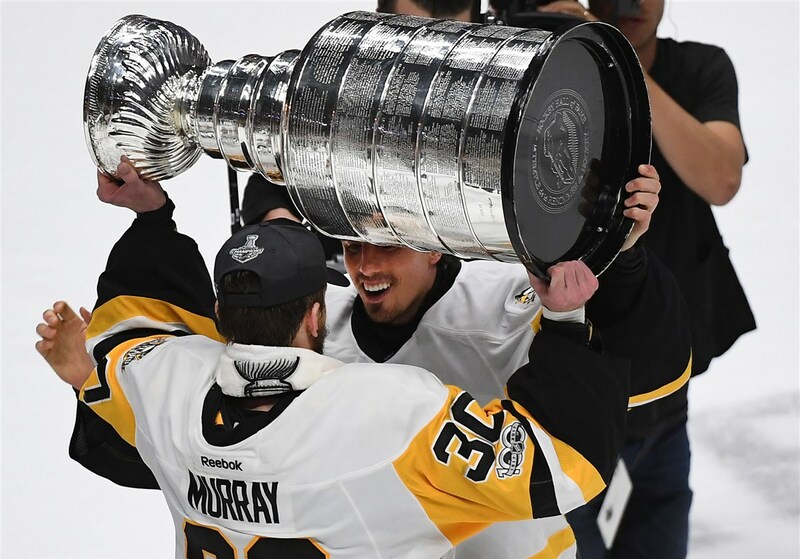 Murray is the (bright) future of the Penguins. The only rookie in the history of this great sport to win two Cups in his "first" year. It's safe to say the franchise is in capable - and lucky - hands. Only a few hours after the Penguin's 5th Championship it became public knowledge that Flower is waving his contractual "No Movement Clause" for the Vegas Golden Knights. Marc-Andre has written the most Disney-esque story in Pittsburgh and he is starting a new chapter in his life under his own terms. Talking to people close to the situation Fleury -who obviously would choose to stay in Pittsburgh - wants to go to Vegas over another team. This option was discussed with him weeks before the trade deadline and he amicably agreed. A valiant move by figuratively falling on the sword for the team who provided him with three Stanley Cups and a home for over a decade. What if the Golden Knights don't pick Fleury? They will, but what if they swerve? Let's see who else is out there. Vegas has to select 14 forwards, 9 defensemen, 3 goalies while hitting a min cap number of 43.8m and maintaining 20 contracts. Every NHL team can only protect one goalie. If that goalie has an NMC (no movement clause) they are automatically that team's pick for protection exposing the rest of the goalies. That is/was the situation that faced the Penguins. They had to choose between Murray and MAF. Flower had an NMC in his contract which would allow Vegas to pick Murray giving the Penguins nothing in return. What IF the Knights decide to pass on Flower and pluck one of the Penguin's forwards or defensemen? The Penguins have Crosby, Malkin, Letang, and Kessel automatically protected by their NMC contracts, leaving them. The Penguins must leave 2 forwards exposed. They must be under contract for the 2017-18 season. They must have played over 40 games in the NHL in the 2016-17 season or 70 games in the 2015-16 season. This would be a tough choice but I would imagine Jim Rutherford would opt to protect Hornqvist, Rust, and Wilson. This, notably, would leave Hagelin exposed along with Kuhnhackl. Hagelin had a terrible season and spotty off-season even being a healthy scratch at points. His speed and contribution to his linemates are unquestionable but his 4 million dollar cap hit can be better spent on retaining the emerging young stars down the line. Kuhnhackl is another incredible talent but you simply don't protect a bottom 6 forward at the cost of losing a top 6 forward. The Penguins must also leave one defenseman exposed that meet the previously mentioned conditions for forwards. This is a tough one. I would say that Cole was considered the better player this season. His performance during the playoffs was absolutely outstanding. Cole is not going to get any younger or better, however. Maatta is young and still not playing to his potential. Do you go for your steady hand or the one full of potential greatness? Tough call. I think the Penguin's adore Maatta and would ultimately leave Cole exposed. Ian Cole is a bargain at 2.1m but the arrival of Dumolin as a top stay-at-home minute eater leaves him a little more expendable.